Rotary actuators with current limitation and manual drive command. U = 28 VDC. Current: 8.5 amps. Speed: 25°/s. Weight: 5 kg. Dimensions: 189 x 184 x 150. Ambient temperature: -40 to +71°C. 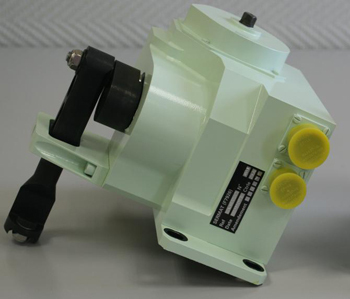 Load: 4800 N.
Rotary actuator with current limitation and manual drive command.